Pranic Healing® is a highly evolved and tested system of energy medicine developed by GrandMaster Choa Kok Sui that utilizes prana to balance, harmonize and transform the body's energy processes. Prana is a Sanskrit word that means life-force. Chi. It is also called Ruach or the Breath of Life in Hebrew. energy body, or aura, is the mold or blueprint that surrounds and interpenetrates the physical body. It is the energy body that absorbs life energy and distributes it throughout the physical body, to the muscles, organs, glands, etc. The reason Pranic Healing® works on the energy body is that physical ailments first appear as energetic disruptions in the aura before manifesting as problems in the physical body. This pervasive energy that surrounds, interpenetrates and sustains the physical body, also affects our emotions, our ability to handle stress, relationships and even finances. Every Pranic Healing session starts with a consultation. This involves ‘scanning’ the affected chakras or organs to determine what work needs to be done within the healing. We will determine the quality of energy within the chakras that could be causing emotional stress, physical ailments or other issues at hand. Each client sits upright in a chair during the healing and is guided in becoming receptive and focusing on the breath. Pranic Healing is a non-touch healing modality working with the prana/chi. 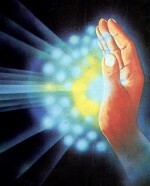 Through the use of a crystal healing tool or the hands, the ailment or emotion will be cleansed out of the system. Once this is complete, fresh prana will be directed back into the client so the body or mind can experience rapid healing and/or relief. It is important to know that after a Pranic Healing session we highly recommend not showering for 12-24 hours. Your body will continue to absorb and release the energy from the healing. It has been observed that immersing the body in water can affect the work that was done during a session. prana. Normal table salt is ideal due to how fine the crystals are. Always make sure you rinse off afterwards. I charge for my time so all treatments are $90 per hour. $60 for half an hour of Pranic Healing.